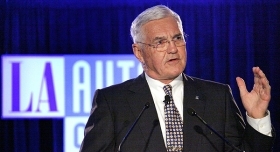 GM will probably make just 4,000 to 5,000 Volts in the first few months of 2011, says GM Vice Chairman Bob Lutz. LOS ANGELES -- General Motors Co. will roll out its Chevrolet Volt in California first, as it ramps up production slowly, Vice Chairman Bob Lutz said. GM will provide 100 Volts to California utility companies in early 2011, Lutz said today in an address at the auto show here. The automaker will produce those vehicles late next year and then send them to California for the companies' use and for road testing, he said. On Monday, Chevrolet division President Brent Dewar had said GM would roll out the Volt in selected U.S. markets before launching it nationwide, choosing the markets by their infrastructure and tax credit offerings. GM will probably make just 4,000 to 5,000 Volts in the first few months of 2011, Lutz said today. Production will reach 8,000 to 10,000 in the first full year, ultimately ramping up to 50,000 to 60,000 per year. He said he expected GM ultimately to sell between 100,000 to 150,000 of all its plug-in hybrids each year. “This is unchartered territory for us,” Lutz said. Lutz refused to answer any questions about Fritz Henderson's resignation as CEO Tuesday, although he was speaking as a last-minute replacement for Henderson. GM Chairman Ed Whitacre announced Henderson's exit yesterday and said he would personally fill the role until GM names a replacement. Lutz dodged many questions about GM's executive turnover during a scrum with reporters after the speech. Lutz said he drove a prototype Volt on public roads over the Thanksgiving weekend. He said GM is designing the battery to have a 10-year or 100,000-mile life. If the battery fails after that, the owner would need to have a dealer replace it, which should cost no more than an engine overhaul on a traditional vehicle, Lutz said. He said he is confident that “there will be a secondary-use market for spent battery packs” that still store energy. For instance, hospitals and homes may use the batteries for emergency situations.